MicroGaming was established in 1994 and has become one of highest recognized providers of online casino software in the two decades since. The company supplies a great range of games, including slots, roulette, blackjack and many other casino favourites, including of course, Video Poker. In this article I look at all aspects of the video poker range offered by MicroGaming. I start by examining the three most popular Video Poker varieties, with an explanation of each and how they differ. I then look at the rest of the range of games, and give an overview of MicroGaming video poker. I finish with a recommendation of a casino where you’ll be able to enjoy these games. MicroGaming offers a great range of 23 games, including a mix of the standard popular games, alongside power poker and many bonus varieties. The games themselves have a particularly bold look, especially since the games automatically enter full screen mode. After each win you’ll have the opportunity to either ‘collect’ or ‘double’ and you’ll make this choice on the game screen, as opposed to an intrusive pop-up employed by some other casino software companies. The games will automatically ‘hold’ your made hands, which is a good touch – although you should refer to the strategy charts offered at this site to ensure the ‘hold’ decisions are optimal. This is the most popular form of Video Poker and is called ‘Jacks or Better’ due to you needing at least a pair of Jacks to hit the pay table. The game offers the full pay 9/6 variety (called this because of the 9 and 6 payouts for the Full House and the Flush) which is the best you’ll find online. 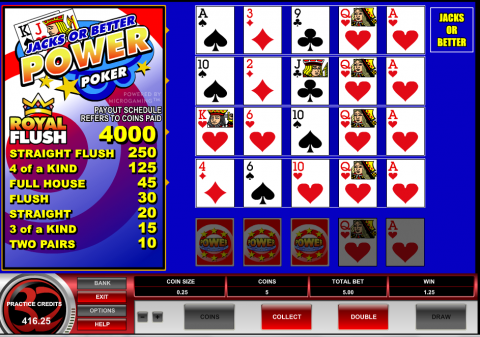 Deuces Wild is a particular variety of video poker where all your 2’s will act as wild cards. Due to this, the range of hands you’ll expect to see will be somewhat better, meaning you’ll need to hit at least 3 of a kind to hit the pay table. You’ll also find 5 of a kind on the pay table, as well as different payouts for a ‘Natural Royal Flush’ and a ‘Deuces Royal Flush’. Joker Poker is similar to ‘Deuces Wild’ in that we have a Wild card in the Joker, however there is just one Wild Card in this game in comparison to four. This also means that you’ll be playing with a 53 card pack as opposed to the standard 52. You’ll need at least a pair of Kings to make the pay table in this game. There are a number of bonus games offered by MicroGaming – these games giving slightly different payouts, with more emphasis placed on hitting 4 of a kind, where you’ll receive a bigger payout for hitting this hand with Aces for example. You’ll also find ‘power’ games, where you’ll be able to play four hands at a time – you’ll hold your selection of cards and the rest of the cards will be dealt for each of the four hands. MicroGaming have a very good range of video poker games. All of them offer solid gameplay and graphically match up to exactly what you’d expect at a Video Poker terminal in a bricks and mortar casino. The auto-hold feature is a good one, meaning you’ll not inadvertently miss out on a big hand by clicking on ‘draw’ without holding those big cards. The power poker range is a good one and offers an exciting way of playing the game – MicroGaming could possibly extend this to offer even more hands? Overall I found the MicroGaming Video poker experience a good one with something for everyone. 32 Red Casino offer the full range of MicroGaming’s casino suite, including all 23 Video Poker games. This site has an solid reputation within the online casino industry and have been the recipient of many awards over the years. You'll enjoy a range of bonuses, including a no-deposit free play bonus of £10, a special bonus of £32 for every £20 deposited as well as extra slots and table game bonuses. The promotions don’t end there however – with a comp points reward scheme, red letter days where you’ll earn free bonus chips, tournaments, freerolls and their dish of the day bonus. Check out the MicroGaming Video Poker titles at www.32red.com now!